PEW recently did a study on Americans and their use of cell phones. The results are interesting, although not all that surprising. We’ve condensed the report into our seven favorite facts, and made them perfectly tweetable for you! Which fact do you find the most interesting? Click the link after it to automatically tweet it! If you’re like most of us here at ZOMM, you’ve probably upgraded your cell phone multiple times over the past few years. Most of those old phones (especially if you’ve been using a ZOMM Wireless Leash to avoid losing them) are probably sitting in a drawer or closet somewhere. It’s not just cell phones either—it’s all types of electronics. How many old iPods, cell phones, printers or other gadgets do you have? There are multiple programs out to which you can donate gently-used cell phones. One such program is called Cell Phones for Soldiers. Established in 2004 by teen siblings Rob and Brittany Bergquist, Cell Phones for Soldiers collects gently-used cell phones in order to provide a cost-free method of communication to deployed troops. Donate your phone. Best Buy accepts electronics of all kinds to be recycled. This includes things like TVs, cell phones, DVD players and AV cables. No matter where you’ve purchased your electronics, you can recycle them at Best Buy. Check out their FAQ for more details. If you want to make a little cash while recycling your gadgets, you can check out companies like NextWorth, Gazelle or even Apple. Typically with these sites you’ll fill out a short evaluation of your device, send it in, and receive a check or gift card in a week or so. This is just a few ways that you can recycle your electronics. For more opportunities in your city, check out this interactive map. Do you recycle your electronics? There are all kinds of information circulating about cell phones, the people that use them and how that’s changed over the years. In order to quickly and easily digest that information, however, we’ve pulled together 4 incredibly insightful infographics about things like cell phones, mobile tech and texting. Text messaging is one of the most-used forms of communication today. If you don’t believe it, check out this infographic which boasts that 3 out of 5 humans on Earth are texters. That is more than the entire population of the world just 36 years ago, in 1975! What’s your favorite mobile-related infographic? From the World’s Largest Cell Phone to the Zack Morris Phone and even a gold-plated iPhone, here on our blog we’ve shared some off-the-wall phones with you. However, today we might just have the wildest and wackiest phones yet. Check out these three bizarre phones from around the world—you just might change your mind about waiting in line for the iPhone 5! A Porsche branded cell phone. The ultimate in speed dialing luxury? We’re not sure, but we can say that this phone is definitely not something you see every day. In 2007, the Porsche cell phone was sold in Hong Kong for $164. From a company called HiPhone comes this iPod Nano look-a-like. While it appears to have a rotary style dial, it actually requires that you press the buttons (unlike the actual Nano). These were popular in China in 2009, so who knows what they’re disguising phones as today. This cell phone has a bonus feature… a stun gun. Yep, press a button and stun away. The stun gun cell phone also includes a flashlight and operates on battery power. As of 2009, the stun gun cell phone retailed for $79.95, but we’re assuming you won’t be able to find a similar model now… This is certainly one approach to safety, but for a better approach, we suggest a Wireless Leash! These are just a few of the weird and wacky cell phones out there available to purchase, but we want to see some of the more recent models. Leave us a comment below telling us about the weirdest cell phone you’ve seen (or heard about) lately! Cell Phone Addiction: How Serious is it? “When you get in your car, you reach for it. When you’re at work, you take a break to have a moment alone with it. When you get into an elevator, you fondle it. Cigarettes? Cup of coffee? Nope, it’s the third most addictive substance in modern life, the cell phone. And experts say it is becoming more difficult for many people to curb their longing to hug it more tightly than most of their personal relationships. And to think, this article was written before the iPhone was released. Cell phones—and particularly smartphones—have come a long, long way since 2006. Along with that, do you think the addiction has worsened? Are you addicted to your cell phone? Do you think addiction to cell phones (in general) has worsened over the past five years? Landlines versus Cell phones: Landlines No More? 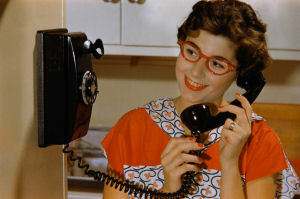 Do you remember using that old rotary phone? Or what about having to stand right next to the phone because the cord only reached a few feet? For many, these landline phones are a thing of the past. And for younger generations, they may never know what a home landline looks like! Safety/emergency situations: When a natural disaster or a nationwide emergency occur, many people use their cell phones to call and check in on loved ones. This can cause the network to run slower, or go down completely. For that reason, it may be beneficial to keep a landline. If you are a cell phone-only household, it’s probably wise to invest in some “insurance” for that phone–what would you do if you lost it? ZOMM can not only help you keep track of your phone, but provides an easy way to call for help in an emergency. With all this information, we have to ask: do you still have a landline? Why or why not?